Show Me Decorating’s Step by Step techniques apply to “Life is so Delicious” ladies event! Step Three. 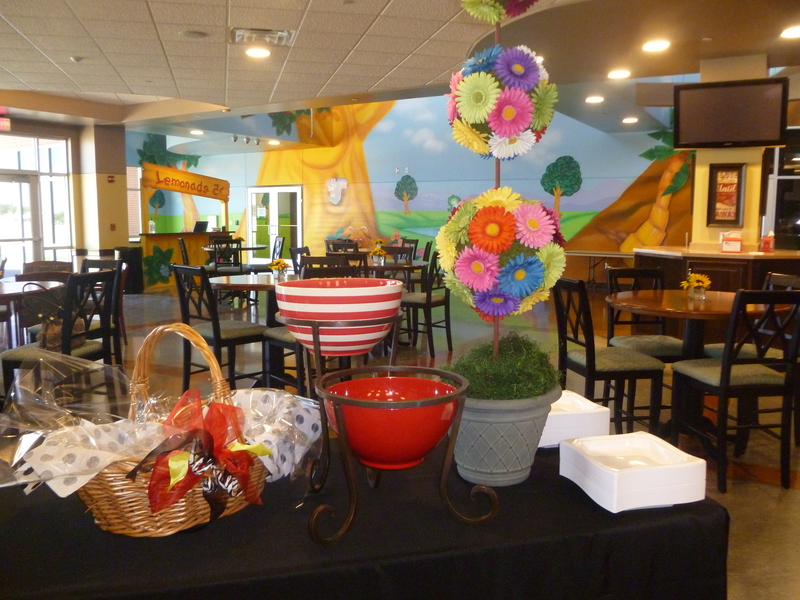 Food Table Scapes. No event is complete without food, and we will show you how to create a more inviting and interesting table scape with unusual containers, risers and fun! 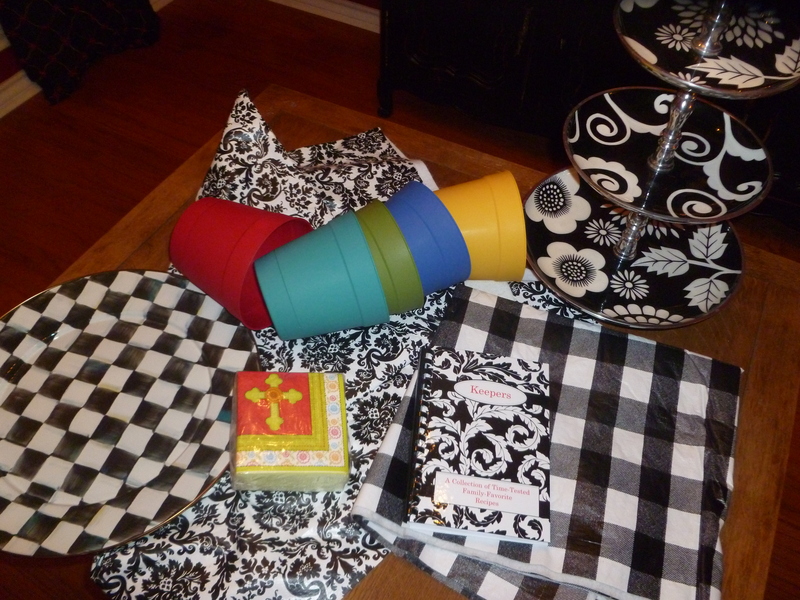 We coordinate our decorating with our theme of “Life is so Delicious”, black and white paisley and check then punch it up with bright colors from our napkins! Paisley table cover (vinyl purchased at Hancock Fabric’s) is placed over a black floor length cloth. Serving pieces are gathered from our collection of black and white. Iron plant stands hold the black and white trays (Courtly Check from McKenzie Childs) and ceramic bowls, add height and interest to the table. The iron garden girl is dressed for the occasion with a tissue and cellophane apron accented with ribbon and wooden spoons. The beginning of the appetizer table and serving pieces! The colorful Gerber daisy topiaries were borrowed from a recent wedding and are made with styro foam balls, moss and silk Gerber daisies inserted onto a wooden dowel. The dowel is set into a florist bucket with plaster and then placed in a plastic garden pot with green moss filling in the base. The appetizer table is ready for the goodies! Yum! Now we can add the appetizers and our guesst and we are ready to enjoy! Serve your self from these inviting and elevated serving bowls. 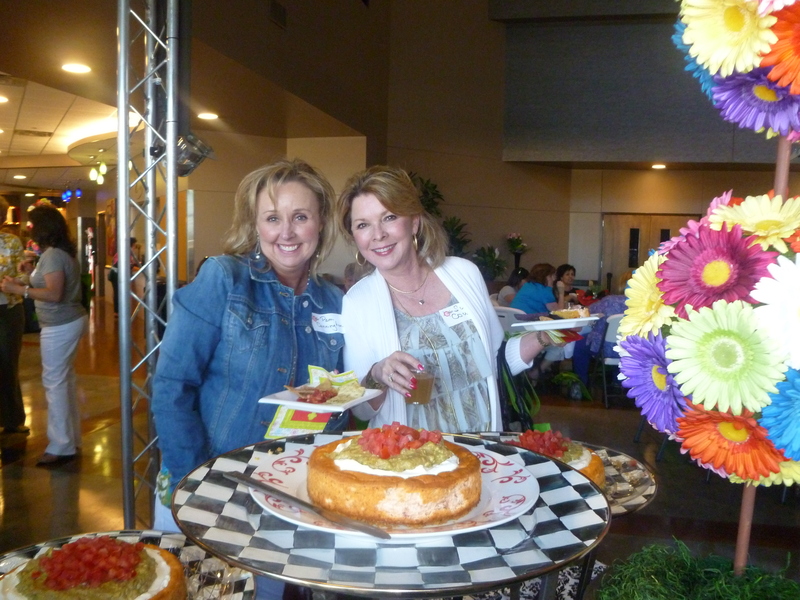 Southwestern cheesecake takes a starring role on this tablescape. Basket is ready for corn muffins and bowls for salad! We repeated the iron plant stands on our main serving table to hold the Ramen Salad and dressed up a plain basket with one of our bows. Learning the basics of bow tieing from our Show Me Decorating app is great for holiday and everyday occasions! After dinner its time for coffee and dessert and we could quickly reset our table with black and white tiered dessert holders and trays. 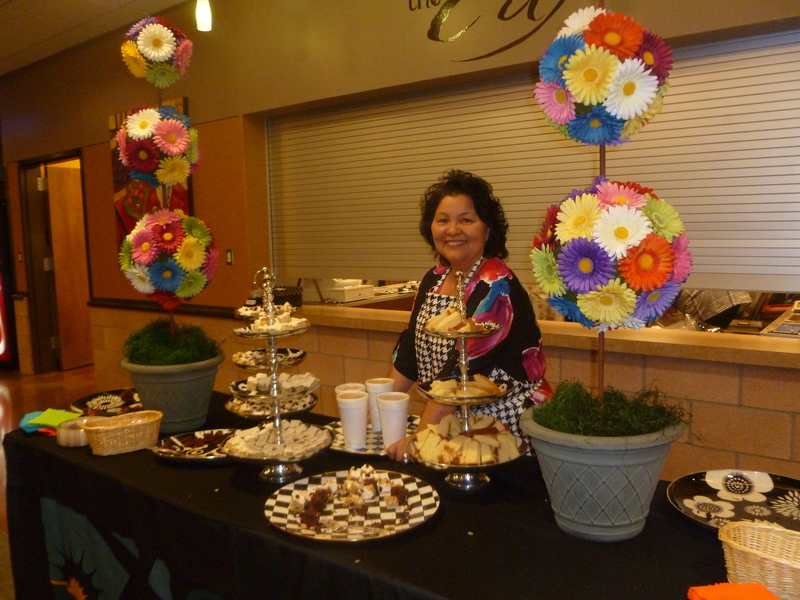 Alta shows off the desert table! showing you how to be the decorator. 1. Selecting a theme and color story (what inspires you or the occasion) 2. gathering your supplies to coordinate with your theme and color story, 3. organizing and executing your plan! Step One. How to gather your materials. Choose a location, select a theme or color story and get started! 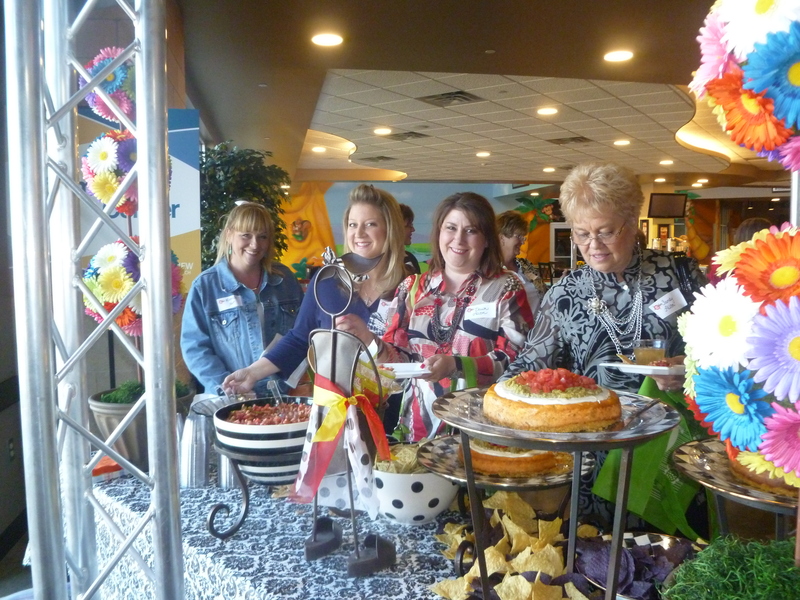 For Example, We are having a Blume Ladies Event at Crestview where we attend church. 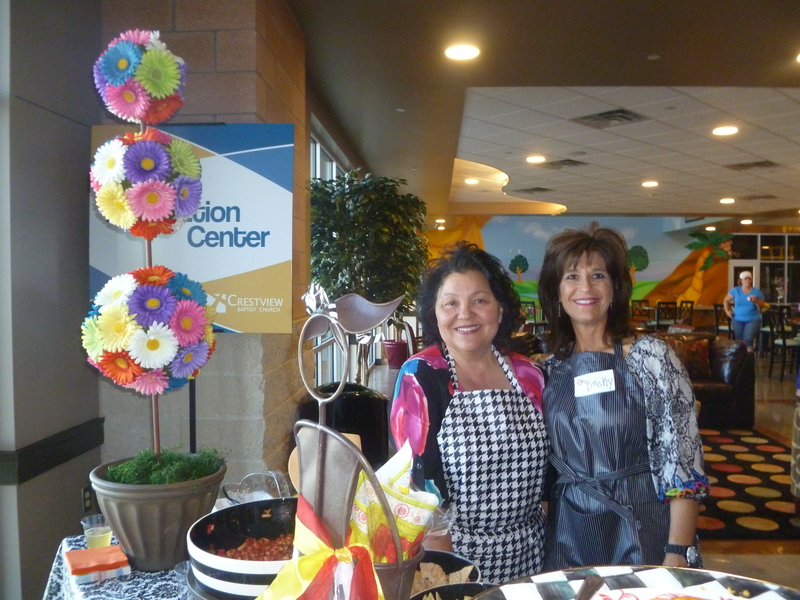 The theme for the event is Cooking, Entertaining and Fun! 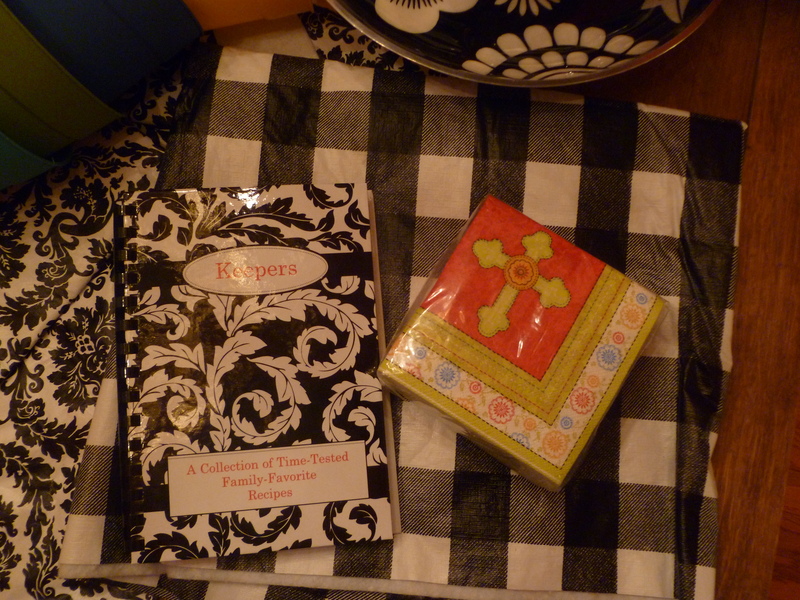 The cover from the Keepers Cookbook (on the left by the event speakers) was the inspiration for our main pattern and colors, and the napkins selected add the supporting color story. 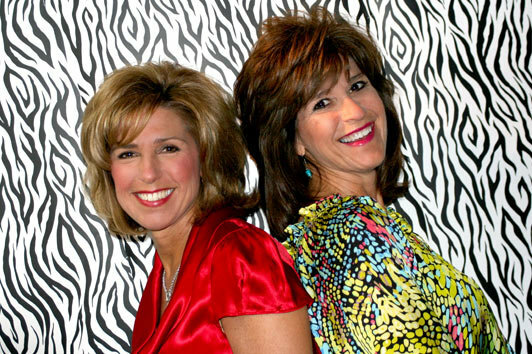 With these two in hand we begin collecting all our supporting items, table cloths, serving pieces, centerpieces etc……. 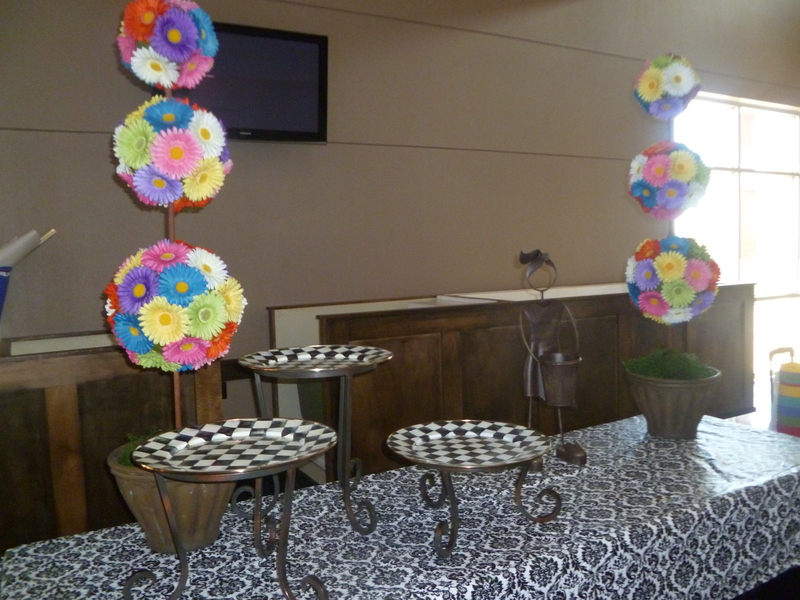 We will use white round table cloths with the black and white vinyl squares in assorted patterns. This vinyl is available from Hancock Fabrics and is great because it wipes off and is reusable! Serving pieces will be an assortment of black and white that we have been collecting. 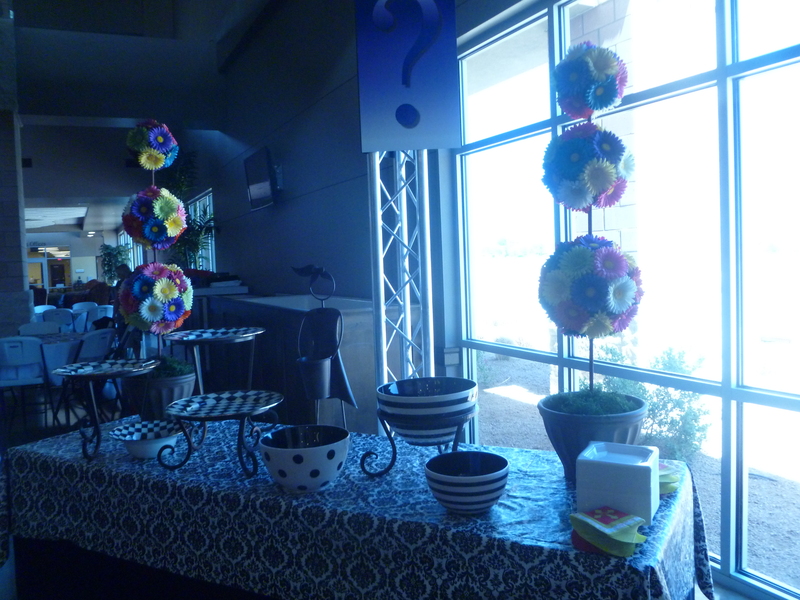 The centerpieces will be potted plants in assorted colors of pots that cost a $1 from Wal-Mart! Notice how they match the colors in the napkins! We will gather kitchen utensils to add to the centerpieces with Ribbon. Collect Supporting Patterns, Gather Supplies! Now that we have gathered all of our materials lets move on to the next step! Step Two. Coming soon in the next blog as we decorate for this weekend…….